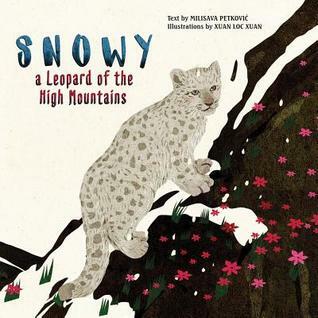 Synopsis (via Goodreads): Snowy the Leopard of the High Mountains tells the compelling tale of a little cub who overcomes danger through friendship, patience, and courage. Snowy becomes separated from her mother as they run away from menacing fur hunters. Lost and lonely, the little leopard cub makes new forest friends who teach her all she needs to know to find her way back home. Artist Xuan Loc Xuan's sensitive illustrations help kids to connect with the author's story on a stirring emotional level. Snowy's moving and poignant journey provides a heartwarming way to get children in touch with nature, and teach respect for animals at risk of extinction. Snowy: A Leopard of the High Mountains was an okay read for me. I think the synopsis made it seem like this book was going to be about more than it actually was, but the story itself wasn't bad. I thought this would be about the impact hunters have on the lives of animals and "teach respect for animals at risk of extinction." However, it mentions hunters twice and doesn't say anything about extinction. Snowy gets separated from her mother when they hear hunters shooting in the distance. Her mother tells her to run while she distracts the hunters, but then Snowy gets lost. Other animals within the forest offer to help her find her way home again, and they teach her some skills along the way. I feel like this book tried to balance reality with fiction, but it didn't always work. The animals that helped Snowy would have likely been her prey, not her friends. She also would not have ridden on the back of another animal... this is all understandable because it's a children's book, but it felt weird when the author also tried to make the content a little more serious. If this book had been about a mother and child being separated, and then the child having to navigate their way home, I think I would have enjoyed it more. The addition of the hunters was irrelevant to the story, because they were never mentioned again. I wish the author had taken the time to explain why hunting animals is wrong, and how it can lead to their extinction. 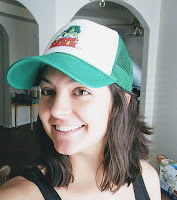 Synopsis (via Goodreads): Who's just the right size? You are! A sweet story about being tall or being small... and about hugging! For all readers ages 3 and up. Did you know that a frog is small enough to perch on a lily pad? A hippopotamus is not (obviously), but he is big enough to scare a crocodile away! And a kitten is small enough to fall asleep in the flowers, but an ostrich is not. An ostrich is big enough to shade her chicks with her wings. 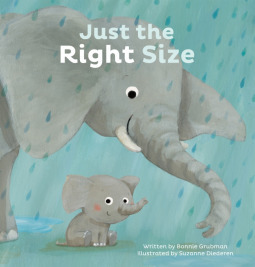 In 'Just theRight Size', Bonnie Grubman teaches children the basic concepts of big and small, and shows that no matter how small or how big, you’re always just the right size. The formatting for this one made it difficult to read, but we were able to grasp the gist of it. The wording was also weird and very redundant. I know it's a children's book, but even my son asked me why they kept repeating the same phrases. If the author had left out all of the sentences ending with "is not," I believe the story would have flowed more smoothly. For example, "A kitten is small enough to fall asleep in the flowers. An ostrich is not." Then the book continues with what an ostrich is big enough to do, and so on. If it had been written a little differently, I think this book would have been an excellent example of opposites and why it's okay to be both sizes. Synopsis (via Goodreads): From the Dynomike series: Dynomike trudges through the cold snow, feeling lonely and blue. Until he meets a magical new friend that has just what he needs to feel amazing again. Now Dynomike is on a mission to spread the joy and love to everyone! We all feel sad and lonely from time to time, but the way we deal with it is what makes all the difference. 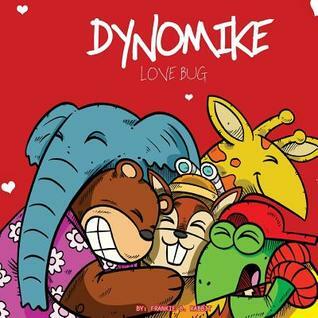 Join Dynomike as he teaches kids the healthy way to get rid of the blues and spread the joy to those who need it—through the magic of the Love Bug! "The whole zoo is smiling. Happiness is compiling. That was a marvelous hug! Was that the LOVE BUG? I've heard of this love plug. My zoo is happy and snug. What about you? Whaddya-say? Need some love too? Stay here and play. We have this magical plug. We'll give you a magical..." bug! The language was incredibly hard to follow, and it barely made sense. The concept of sharing love and brightening someone's day--great. However, that concept was overshadowed by how difficult this book was to read though. Synopsis (via Goodreads): Every year in Vampire Creek there is an initiation ball for adolescent bats who have not yet tasted human blood. Hilda, a vegetarian, is blissfully ignorant of the purpose of the ball. I barely made it past the prologue, and even that was a struggle. This format and writing style might work for some people, but it really wasn't for me. It also wasn't fun to read out loud to my kid. This was supposed to be a children's book, but I have no idea how a child is supposed to read through this and understand anything. "I had gone to bed at nine of the clock. This is early for me, but I was more than usually tired, having topped off my supper with a portion of Stilton bigger than my head. My stomach was dragging me down towards the floorboards, and it was with great difficulty that I remained upright at all. Cheesy fumes filled my brain. Sleep was knitting up my eyelashes with a greenish crust. I concluded that I must become horizontal with great haste otherwise I would surely die." 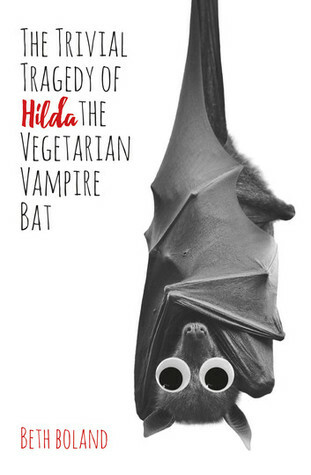 I was really excited about a vegetarian vampire bat, so I'm bummed this one didn't work out. Haha! I have no idea what was happening in the book, but spreading love seemed to be the main focus. If someone was sad or having a bad day, they need a hug and the love bug. I just don't think it was executed well, or my review copy was wonky. Seriously, that bat book is for kids? What child would understand that ridiculous writing style? How the heck did that one get the green light? Blah. You’d think a children’s editor would have had a field day with these but I guess not. It was overly complicated for a children's book. There were too many extra and unnecessary words, but I still think it might appeal to some (older) people. When I posted my review on Goodreads, I saw that I was not the only one to have issues with the writing style. It's definitely not a kid's book. Dr. Seuss books are my standards for best children books ever. Though the Bernstein Bears are a close second. It's been AGES since I've read a Bernstein Bears book! I did see what you did there, Lol! I'll have to see if my little brother likes Bill Pete, I haven't heard of him before and I've been looking for new books to read to him. Some of our favorites are The Caboose Who Got Loose, The Ant and the Elephant, Chester the Worldly Pig, and Eli! I love kid books and these covers are adorable. Especially the bat one. Too bad the story was unreadable. I was disappointed with this batch of books... I'm hoping the next few are stellar and remarkable! A vegetarian vampire bat sounded like a lot of fun to read about, but I could not stick with the writing style and the language. If you think you might enjoy the writing style, try it! It just didn't work for me. It's also a lot longer than I was expecting for a children's book, but even if it's more MG, the writing is hard to follow. Just the Right Size sounds so cute, too bad it missed the mark! I think my niece would have enjoyed it. You might still give it a shot! I would recommend checking out through your library first to make sure it's something you and your niece would enjoy. I felt like it was repetitive and had the opportunity to be more than what it was. Let me know if you decide to try it! Just The right Size looks cute, too bad it was a little hard to follow. And Snowy looks awesome (love snow leopards) although I agree with your assessment- unless I'm mistaken they're endangered, aren't they? I guess I better look. But it sounds like a nice book even with the issues. I would like to see a finished copy of Just the Right Size to see if that helps. The formatting was all over the place, so I could have misunderstood the author's intentions. However, based on what I had it felt repetitive and like it had the potential to be more. I love snow leopards, too! I also think they're endangered... the book had some information at the end, so I guess I should have read that, lol. It was a nice story overall, but I wish the focus had been shifted to Snowy's accomplishments. It's hard to find really wonderful children's books. We check out 45-50 books every time we go to the library (50 is the limit) and maybe 3 of those books would be ones I'd want to buy for our shelves at home. I have high expectations for children's books, because my children are going to read them.